Pitching is changing and organizations are trying to find the best way to take advantage of the arms in their system. Clubs have started to utilize an opener so that the starting pitcher can avoid pitching to the top of the line-up during the first inning. It also seems like teams are turning to their bullpens much more frequently. With pitching evolving, it’s hard to predict what young pitchers might be asked to do at the big-league level. Will pitchers be asked to throw 200 innings on a regular basis? Or can teams be more effective by using more pitchers and limiting their innings? 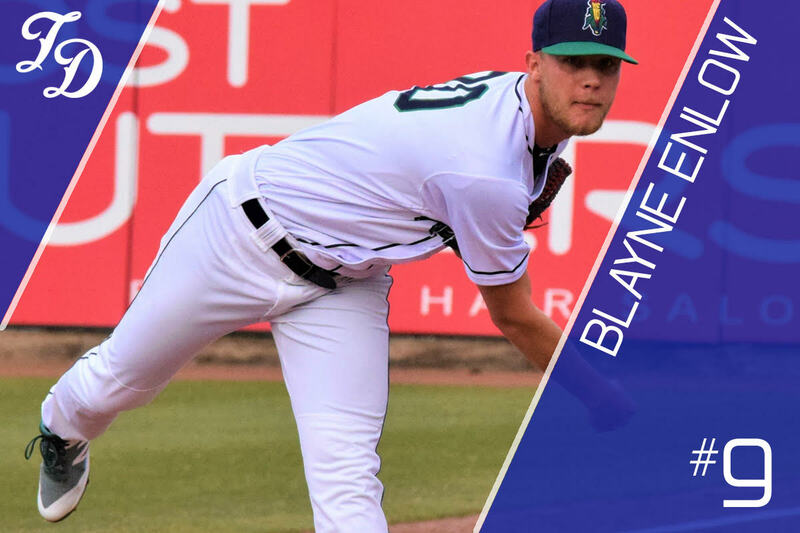 No matter what happens moving forward, Blayne Enlow looks like an arm that will provide plenty of value for the Twins. Enlow could be entering his sophomore season at LSU but Minnesota was able to steal him in the third round of the 2017 Draft. They had to go over slot to get him, but the team wanted him badly enough to make the move. It also helped that the club had saved some money on signing Royce Lewis with the number one overall pick. In his professional debut, Enlow burst onto the scene with the GCL Twins. He posted a 1.33 ERA and a 0.69 WHIP in 20.1 innings. He only allowed three earned runs and he posted 19 to 4 strikeout to walk ratio. It certainly seemed like the Twins aggressive draft strategy was paying off. Minnesota continue to be aggressive with Enlow in 2018. Instead of pitching for the E-Twins, he was bumped up to Cedar Rapids. In his last 10 appearances (53.1 IP), he had a 2.36 ERA and a 40 to 17 strikeout to walk ratio. His inning total increased over the season’s final months and he ended August with an 8.9 K/9 mark. His fastball can reach the mid-90s and his curveball continues to be a strong pitch. When he was drafted, MLB.com’s Jim Callis called it the best curveball in the draft. That placed him ahead of multiple college arms. His delivery allows him to put a lot of movement on his pitches. He has a good one-two punch with his fastball and curveball, but he needs time to continue to develop other secondary pitches. He worked on a changeup this season and hopes are that he will be able to continue to work on his secondary pitches as he continues to pitch more professional innings. He continues to have the opportunity to grow into a better pitcher, which should come as he works his way through the system. During the 2018 campaign, Enlow was placed on the DL multiple times with muscle strains. His highest pitch total was 87 last year and he reached that total on three separate occasions. Other than that, there were only three other times he crossed the 80-pitch mark. Enlow averaged just under 67 pitches per game. He should get stretched out even more during the coming season. By pitching deeper into games, Enlow will get the opportunity to work more regularly on his secondary pitches. This will make him a stronger pitching prospect as he pitches his way towards Target Field. After spending last season in Cedar Rapids, Enlow should spend all of 2019 pitching for Fort Myers. Minnesota will continue to take their time with Enlow since he is young and continuing to work with his secondary pitches. At this point, it is about him adding strength to his frame and building up his innings totals. Starting pitching continues to evolve, especially with addition of openers and more frequent use of bullpen options. By the time Enlow makes it to the big leagues, starting pitchers might only be asked to make it through the line-up a couple of times. With his top two pitches, he might be a dangerous arm no matter what role he is given. TD Top Prospects: #8- Coming Tomorrow! Get to know more about Enlow and many more minor league players in the 2019 Minnesota Twins Prospect Handbook. That is an impressive season for a 19 year old in A ball.So far looks to be as good as advertised from the draft.A good season at high A and he'll be moving up a head of schedule. Speaking of A+ it looks like that will be the team to watch this year.With Graterol, Enlow, Duran, and possibly Balazovic you have four young pitchers that appear to have mid to front-line starter stuff. Nice to see some strong pitching candidates coming up through the system. Here's hoping that Enlow is a big part of wave two for the Twins. Hoefully, Graterol will be there a very short time, if at all. If he posted a 1.33 ERA in 20 GCL innings, and end the season with 53 innings of 2.36ERA in Low A, he must have had a really rough first 21 innings in Cedar Rapids to wind up with a 3.26 ERA overall. In any event, I certainly hope he pans out. For some reason I feel like he’s on the same path as Gonsalves. An exciting young pitching prospect? Let's be patient and hang on to him! From everything I've read so far, he could turn into a solid MLB pitcher in the coming years. Please, please, please let this happen ... and happen with the Twins. . Fingers crossed with Enlow. Still, I'm a guy more interested in strikeouts, hope those hit a significant uptick. A 6.8 K/9 in Cedar Rapids is a bit ominous to me. I'm guessing he's throwing too many two-seamers? I'm not a pitching guru or anything, but I did happen to catch a couple Enlow starts in CR last year.I'd say he needs to just keep working on command and control.Of course, that is probably true for 99.9% of the pitchers out there (I'll leave .1% open for Maddux & Co.).It especially applies to all 19 yo pitchers though. Anyway, the first time I watched him, he threw quite a few pitches in just a couple of innings and then they went to the pen. Maybe this was due to one of those muscle pull injuries. The second time I saw him, he was much better and went deeper into the game. He still walked a couple, plunked a couple and had some backstop balls in there. But, he also was hitting 94 at times, didn't give up many hits and got some Ks. I agree with the poster above that the possible FSL rotation full of 20-21 yo pitchers is nice to see. OTOH as I review the game log, his manager/coach did pull him from the rotation briefly, for a couple of relief outings, around where his seasonal turnaround occurred, so quite possibly they did tinker with something. Looking at stats in the minors is a pretty crude tool. I personally think that Enlow would benefit more from a mid-season promotion. His K rate was pretty low in CR... granted his age was also impressive, but I think I'd rather see him start strong out of the gate and see improvements in the K and BB rates and then promote him mid season. He's not a 40 man candidate for another 3 seasons, so there really isn't a reason to push him that hard unless he looks flat out awesome this spring. I like Enlow. I think this will be an interesting season for him, not on a make or break sort way but more on a developmental path. If the changeup starts coming together, if his command and control continues to develop and he's able to get deeper into games, if he continues to physically develop and avoid the minor injuries...he could be a fast-track guy. If not on some of these questions, he'll probably take a slower development path. He's got the plus curve that could be an elite pitch, and a good fastball to support it, so the future looks bright on him. Without a 3rd pitch he probably ends up in the bullpen at the MLB level, but mid-90's heat (more if he doesn't have to pace himself?) and a wipeout curve can make for a nasty backend reliever too. Future looks bright, upside is there, good start so far. but long way to go on this guy. I don't get the lack of k's with his velocity and breaking ball. control must be pretty inconsistent. His velo and curve are major league level. but control is part of "stuff". a big part. If he throws 5mph faster than Gonsalves, then he is is on a significantly different path. Honestly, positions 7-20 or so are fairly interchangeable. Most of these guys have pretty decent upside, but enough questions to hold them back. By the time Enlow makes it to the big leagues, starting pitchers might only be asked to make it through the line-up a couple of times. Well, yeah...for the ones that aren't actually good. If the projection for Enlow (or any 'starter') is that he can be a good 4-5 inning 'follower'...then he shouldn't be ranked this high. The bar will continue to be...and needs to be...set higher for arms that are drafted as high as Enlow was. So far, IMO, he's not done anything to discourage the higher ceiling. Maybe the mediocre K/9 numbers (so far) and distance from the show have me ranking him a little lower. Nick Blackburn, Kohl Stewart Brandon Kintzler and Matt Capps threw relatively hard too. If they're just up there throwing sinkers half of the time, they're not going to miss many bats. Not sure what to think of Enlow at this point.His fastball did hike a couple of ticks, his curve was fine, but his changeup did not move.Still young, it is more than perfectly fine to work at one thing at a time, and it seems that he worked on velocity, but he really needs a third pitch badly, if he wants to be a starter. This might be compounded in 2019 by the fact that the FSL is such a pitcher's league, making any improvement in the numbers maybe not as meaningful as noted.I'd really look at two things for Enlow in 2019:Improvement in command and game planning (using K% as an indicator - no reason that it has to be so low. )And the development of an above average third pitch. I like Enlow, a lot, but this type of pitcher does not seem to make a major player for me until he succeeds at AA.The third pitch will be key as will consistency in finding the strike zone.The FSL still has a lot of filler in it and while we all would like his numbers to be great, they are going to have to be very good to convince me he is the real deal. Maybe I need to see him, but am not going to be in Florida long enough this year to see an FSL game.